We partner with AWG, the second largest retailer-owned grocery co-op in the United States, with almost $10 billion in buying power. 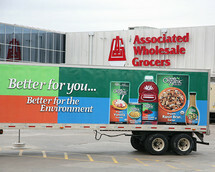 This partnership allows us the opportunity to compete on price with the nation's largest grocery retailers. We often buy in truckloads to reduce the cost. We have access to over 250,000 items between AWG and our vendor partners, so we can carry anything you need.